Mamidikaya nuvvula pachadi is a classic, traditional Andhra chutney made with fresh grated raw mango and roasted sesame seeds. Raw mango in telugu is called mamidikaya, sesame seeds is nuvvulu and chutney is called pachadi. 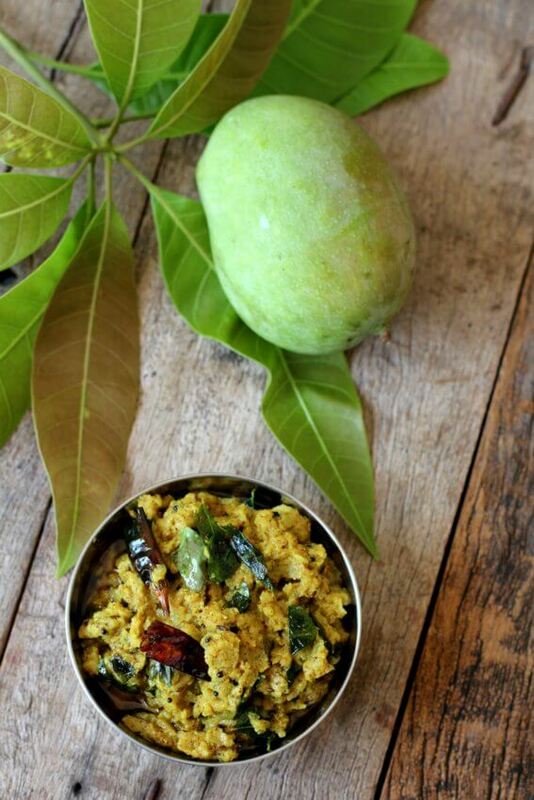 Raw mango or mamidikaya is used extensively in Andhra cooking, both in vegetarian and non-vegetarian dishes. Each home has its own raw mango speciality dishes based on the region or community and availability of spices or ingredients. 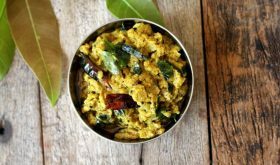 A few popular raw mango dishes Andhra style are mamidikaya pappu or mango dal, mamidikaya pulusu or mango stew, mamidikaya pulihora or mango rice, mango rasam and mamidikaya kobbari pachadi or mango coconut chutney. I am sharing a very old family recipe which is much loved in our family. As I share this raw mango recipe with you, I am transported to my younger days. Raw mangoes do get me all nostalgic because it reminds me of my grandmother who made a variety of chutneys, pickles, stews, curries using raw mango. 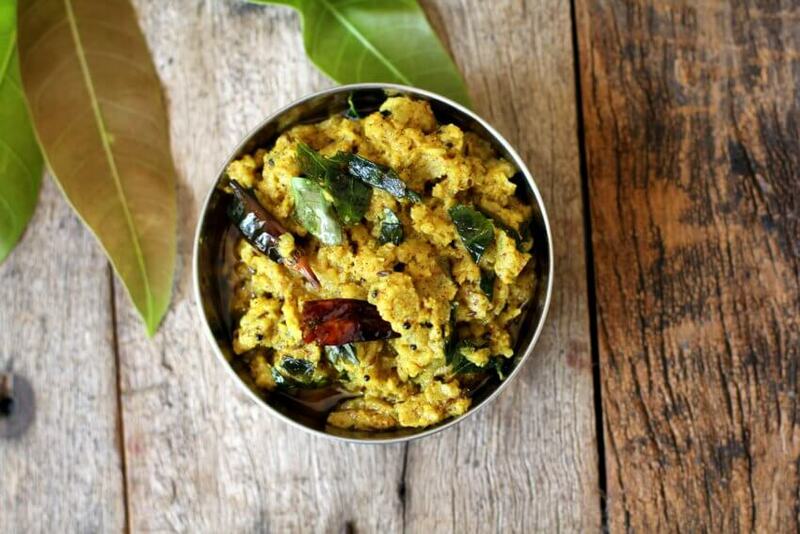 Mamidikaya nuvvu pachadi is one of her classic raw mango recipes. A simple yet flavorful vegetarian pachadi that will have you craving for more. Roasted sesame seeds or til is the main ingredient that gives the pachadi all its flavor. Whole red chilis are added in the tempering along with cumin seeds and curry leaves. It’s important you use mangoes that are not too sour. The mangoes should have a sweet-tart flavor. The sour flavor of mango is balanced with the nutty flavor of sesame and the subtle heat of red chilies. With a subtle tart, spicy and nutty flavors, this smooth textured, raw mango chutney is to die for. And I must tell you that the kitchen smells so good while preparing this pachadi. I love how the beautiful green color of raw mango is retained in this vegan pachadi. It is a simple recipe to make and the only preparation is peeling, grating the raw mango and roasting of sesame seeds and spices. It’s worth the effort, trust me. I urge you to try it when raw mangoes are in season. This raw mango chutney goes well with steamed rice and a dollop of ghee. You can also serve it with roti or dosa. It works as a spread for crackers too and it tastes YUM. Do give it a try and add it to your list of pachadi recipes or raw mango recipes. Heat oil in a heavy bottomed vessel, once hot, add the mustard seeds and allow to splutter. Add the cumin seeds, asafoetida, red chilies, and curry leaves and mix. Immediately add the grated mango and turmeric powder and mix. Cook on low-medium flame for 7-8 mins without a lid or till oil separates. Add the sesame seeds powder and mix and continue to cook on low flame for a min. Add the mustard seeds powder, methi powder, and salt, mix well and turn off heat. Remove to a serving bowl and serve with steamed rice and ghee. It stays good at room temperature for at least two days. You can refrigerate it for a few days. Do not use too sour mangoes. Slightly sweet-tart mangoes work best. The mustard seeds need not be dry roasted before grinding to a powder.